Russell Porter has the enthusiasm of a happy-go-lucky child in a man’s body. Buggy Whip, his successful family company, needed a rolling UTV showcase to help promote its products. Russ jumped like a kid in a candy store at the prospect of turning a Can-Am Maverick X3 X rs into a wicked display car. Buggy Whip has a great reputation, so many leading companies were ready to participate in the build. Russ was able to pick and choose, but he did a lot of choosing, so there are a monster number of products on this rig: it’s almost mind-boggling. The best part is that many of the parts are attainable for the normal UTV enthusiast. We give Porter a round of applause for picking parts that are not only pretty cool but also quite useful. At least he topped his “Overkill X3” off with a set of his own whips! If you have never had the pleasure of meeting Russ, he is one of those guys who can get along with anyone. This is fortunate, because he had to befriend a lot of people to help get his X3 built. Russ grew up with sand cars, so it was natural that he wanted to increase the horsepower. He installed an Evolution Powersports Stage 4 kit, which includes injectors, and a waste gate. He continued with a Maptuner X to control the fuel increase and turbo boost with a custom-anodized aluminum case. 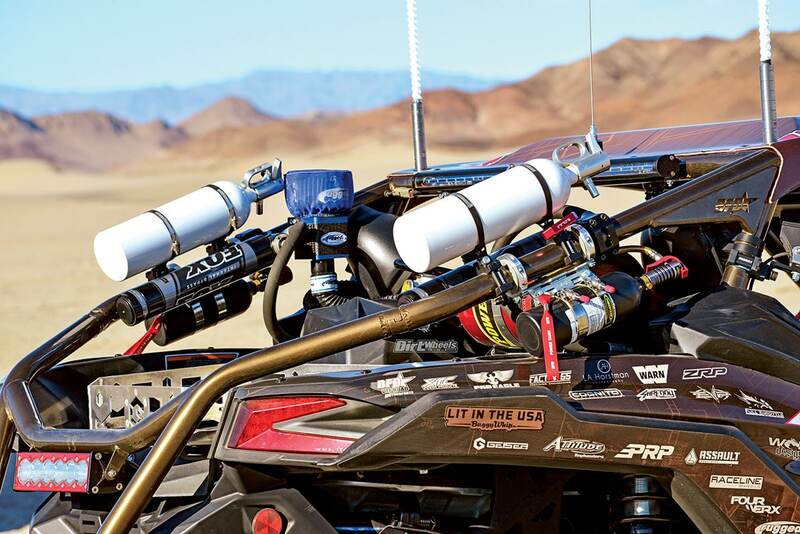 Evo offers a blow-off valve kit and silicone charge tubes that made their way onto the Can-Am, as well as a race bypass tube along with a cutout-style exhaust system. When you add weight to a machine, it affects performance. Increasing horsepower helps out, and so does clutch tuning. Russ has yet to get the clutch tuned or upgraded, but the power parts from Evo helped keep the Overkill X3 moving quickly. A lot of serious builders go with Cognito Motorsports’ long-travel suspension kit. This is one of the earliest Cognito kits for the X3. The A-arms and trailing arms are literally works of art. The front suspension is finished up with Assault heavy-duty tie-rods, Zollinger (ZRP) knuckles and Summers Brothers axles. The rear gets ZRP knuckles and Summers axles as well. 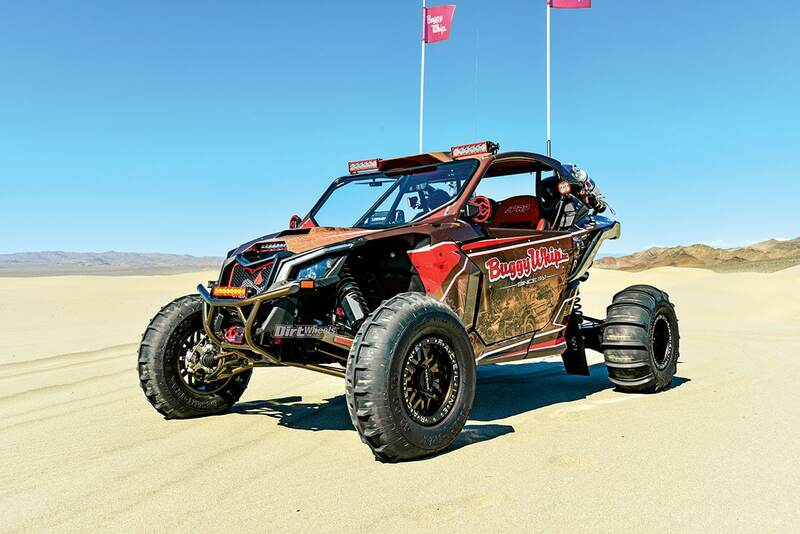 For the sand, project Overkill X3 uses Raceline wheels and Sand Tires Unlimited paddle tires. The wrap was designed and installed by Wolf Designs to commemorate 50 years of Buggy Whip being in business. BFD Offroad had a big hand in how this machine looks. First, it came up with a smoother and stronger cage with an integrated rear bumper. BFD pairs the cage with a unique contoured composite roof that hugs the lines of the new cage. It has a racy look with a center scoop molded in, but for cars that run a windshield like this one, the scoop channels cool air into the cab and directs it towards the car’s intake. BFD also supplies the glass windshield. The BFD style continues with the custom hood kit and a unique front bumper that makes a Warn winch look racy. The final part of the BFD equation are custom doors that integrate nicely with the cage and body lines while offering protection for the passengers. Assault rounded out many of the details with Sidewinder convex side mirrors, a grill insert, a fire-extinguisher quick-release kit, a Stealth in-cab rear-view mirror, Stealth visors, front shock guards and even a registration sticker plate. Assault’s D-shaped steering wheel could conceivably be considered part of the suspension and handling package. There is $3000 in ECP powdercoat on the Overkill X3, and of course it is completely covered in the Wolf Designs wrap that commemorates Buggy Whip’s 50th year in business. Not all of the accessories are for style. Some are for music, and there are loads of lights. Most are from Baja Designs, but of course there are those great-looking, lighted Buggy Whips with flags on top. There are Powertank air tanks to fill tires and fire extinguishers from Safecraft mounted to the roll cage. PRP Seats, wrapped with red ostrich leather, were installed along with their five-point harness systems. The dash holds Rugged Radio, Evo Powersports, Lowrance, Assault Ind. and Mob Armor products. As high-end as the Overkill X3 looks on the outside, it looks somewhat subtle compared to the interior. Open the doors and get socked right in the eyes by arrest-me-red, simulated Ostrich Podium Elite PRP seats with cooling, heat and lumbar support. The PRP belts are an equally scorching red. The rich automotive look continues with doors that look upholstered, but are actually completely covered in luxurious custom door bags. The upholstery continues to a custom roof liner as well. Offsetting the soft rich red Ostrich is a Fourwerx carbon fiber race dash and a billet shift gate and covers for the ECU and battery from Geiser Performance. 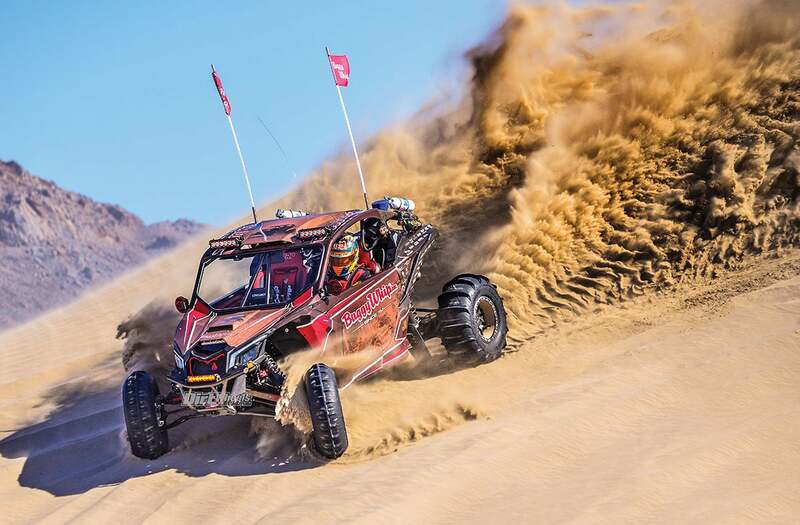 Raceline beadlock wheels are placed on this rig in the sand dunes, along with rubber from Sand Tires Unlimited. In addition to all the new lighting that was added to Overkill X3, Russ made sure that every possible radio and communication option possible from Rugged Radios was included. Rugged also produced the clean-air system that pipes filtered air into the driver and passenger helmets. Maglock makes magnetic connections that attach the air hoses to the helmets. For GPS, the X3 runs Lowrance products. With all the added electronics, there was a lot of wiring that needed to be handled. Switches and harnesses from XTC Power Products helped dial in all of those connections. Multiple Safecraft fire extinguishers were installed on the machine, along with Powertank products. You can also spot a Rugged Radios pumper system. Check out the parts list to see all that went into this amazing build. We all appreciate a great-looking machine, but for most of us, our OHVs need to work, or what is the point exactly? When we shot the Overkill X3, it was really on the first outing in completed form, and the third outing overall. We’ve seen cases where a fresh car has teething problems. UTVs benefit from tuning and setup to make sure that all the accessories work together as they should. 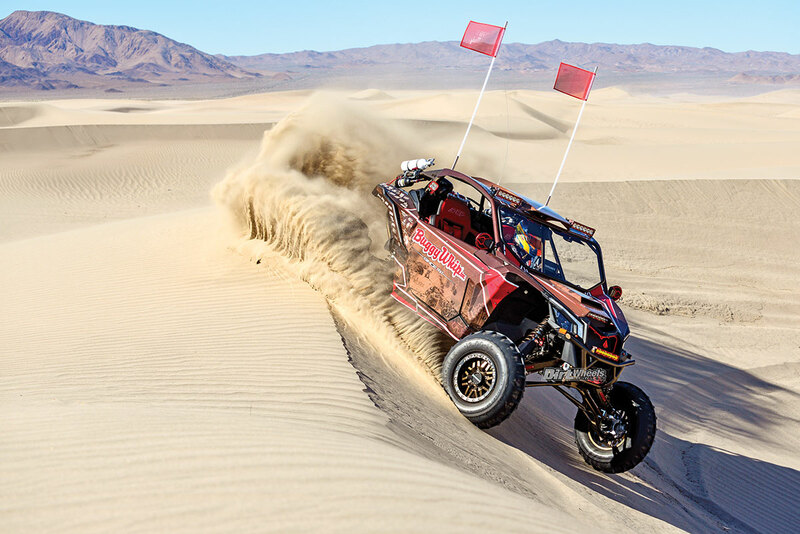 The shocks have not been tuned for the completed car yet, but even so, the Overkill X3 is a truly fun car in the dunes. With the paddles, we didn’t do any desert driving. In the dunes we were able to run the car hard. 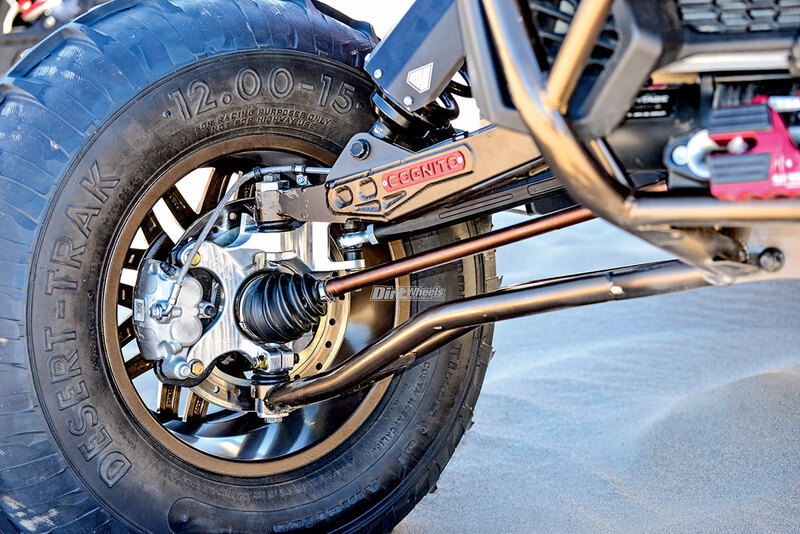 Look at the roost in the photos and you will see that the Evolution Powersports mods added plenty of power for paddles that are scooping serious sand. Russ drove the car hard, and when he turned it over to us, he was in no hurry to get back to the truck and trailer. He was encouraging us to run the car harder and longer. Our ace photographer Patrick Carrigan was our leader for follow-the-leader. That wasn’t fair; the best Dumont hound in the trickest UTV. We were chasing in a stock X3 and a Polaris RZR S. Nothing was staying with the modified machine. It does more than look good! This is a seriously fun machine, and driving a car that looks this great is a surreal experience. Russ installed a Cognito Motorsports long-travel kit on the front and rear of the Can-Am. He didn’t re-valve his shocks yet, but that’s a future upgrade for it. Obviously, most of us will not sign up for the full list of products used on the Overkill. But, all of these products will improve any Can-Am X3 model a ton. Just pick and choose the ones that you need, or perhaps just want. Your X3 might not be overkill, but it could be your perfect X3. 10” OnX6 Hi-Power $599.95 $1199.90 ea. 10” OnX6, driving/combo $429.95 ea. Pair Squadron sport driving/combo (B-pillar) $229.95 ea. 10” S8 driving/combo $329.95 $659.90 ea. S8, Amber combo lens kit $14.95 ea. LED rock lights $64.95 ea. Uplifter wiring harness, OnX6/S8 $13.95 ea. 4-foot LED whip $199 ea. Podium Elite w/ custom red ostrich, cooling, heat & lumbar support $864 ea. Colby rescue valves $17.95 ea. Handheld tanks PB5 $293 ea. Custom LED switches (12 switches) $19.95 ea.